Straggling evergreen shrub, rarely over 7 feet. Twigs smooth, green; reddish brown on older branches. Needles 2-ranked, 3/8-1 inch long, narrowing into abrupt fine points; green on both sides, but with light green bands below; needles often develop a reddish tint in winter. Female plants produce juicy, cuplike red arils (pulp) surrounding 1/2 inch fruits. Seeds stony. Rich woods. Newfoundland to West Virginia; northeastern Kentucky to Iowa. Compounds in this shrub have been found to be effective in the treatment of breast cancer. Native Americans used minute amounts of toxic leaf tea internally and externally, for rheumatism, bowel ailments, fevers, colds, scurvy, to expel afterbirth, dispel clots, diuretic; twigs used as fumigant in steam baths for rheumatism. Leaves (needles) said to be antirheumatic and hypotensive. 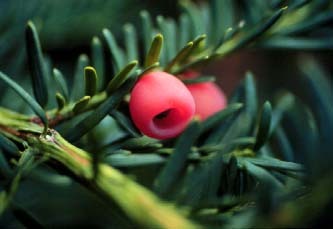 Yew sap was used by Celts to produce poison arrows. A component of the plant is under investigation for anticancer activity. The long bow was made of the wood of the yew. All plant parts (except perhaps the red aril) of this and other yews contain the toxic alkaloid taxine and are considered poisonous. Ingesting as few as 50 leaves (needles) has resulted in fatalities. Berries are considered poisonous to man and beast.